I’ve written before about how L. Frank Baum’s position on trickery is somewhat mixed. As someone who had worked as a salesman, he knew the value of a certain amount of balderdash in order to sell things to people. And not all of his characters who get by on tricking others are strictly bad, although they do generally get some sort of comeuppance. 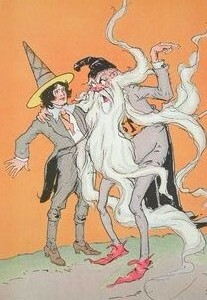 We all know about the status of the Wizard of Oz as a humbug, although he later reforms. On a lesser level, the Wogglebug and Frogman both make themselves out to be smarter than they are, but it’s not like they aren’t intelligent characters. It seems that the bug considers himself Thoroughly Educated despite only having had what amounts to a grade school education, but he does a lot of the thinking during the events of The Marvelous Land of Oz and the Queer Visitors from the Marvelous Land of Oz stories. He also frequently annoys his companions with his airs and terrible puns. The Frogman makes himself out to be the wisest creature in the world, but is forced to deny this after having bathed in the Truth Pond. Other foolish characters who make themselves out to be intelligent include the donkeys of Dunkiton (although they’re really only fooling themselves) and the wise men in Mother Goose in Prose and The Magical Monarch of Mo, although the latter are rather gruesomely combined into a single sage who is actually competent. 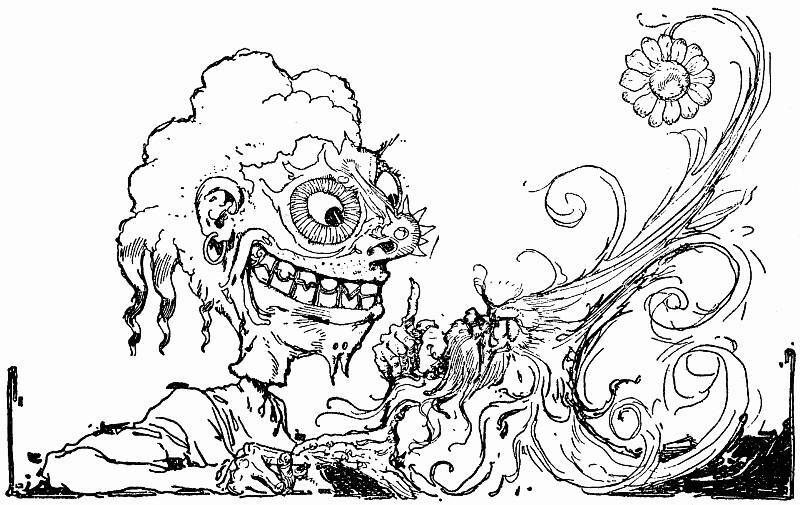 Some cases of deception are simply a matter of characters pretending to be more threatening than they actually are, as with the Wheelers‘ constant yelling and warning in the sand when they really can’t do much to hurt anyone, or the Whimsies‘ giant pasteboard heads that they wear over their tiny ones. In John R. Neill’s Scalawagons, the Bell-Snickle inflates himself in order to make the walking trees fear him. The shape-shifting Phanfasms operate pretty much entirely on deception, never letting outsiders see their true forms or that of their city. The Nome King is is very deceptive at times, particularly when first encountered in Ozma, although he and Kiki Aru also try to scam the animals of the Forest of Gugu (and each other) in Magic. Kwytoffle in The Enchanted Island of Yew does much the same as the Wizard in pretending to have magic powers in order to rule a country. After the King of Auriel, the western country on the island, dies, Kwytoffle takes over, threatening to turn anyone who challenges him into grasshoppers and June-bugs. He also takes control of the army, who actually carry tin swords and wooden axes. When Prince Marvel and his companions call his bluff, he’s forced to admit that he has no magic at all. It’s a pretty funny scene, although by this point in the story Marvel has proven he could probably easily trounce an ACTUAL sorcerer without breaking a sweat. Kwytoffle appears to be both more malicious and more pathetic than the Wizard of Oz. The latter also doesn’t have any magic, but he does have stage tricks he can use to fool people, while the Aurielian apparently relies entirely on hearsay. There’s also no indication that the Wizard was ever the tyrant Kwytoffle was. I wonder if he ever proposed building a wall and making Plenta pay for it. This entry was posted in Characters, John R. Neill, L. Frank Baum, Magic, Oz, Oz Authors and tagged bell-snickle, deception, frogman, humbug, kiki aru, kwytoffle, mother goose in prose, nome king, ozma of oz, phanfasms, professor wogglebug, queer visitors from the marvelous land of oz, the enchanted island of yew, the magic of oz, the magical monarch of mo, the marvelous land of oz, the scalawagons of oz, the wonderful wizard of oz, wheelers, whimsies, wizard of oz. Bookmark the permalink. There is also a devious character in “The Forest Oracle” from ANIMAL FAIRY TALES. Baum was apparently quite aware that delivery and presentation often matter more than accuracy when wanting to be seen as profound.